The trail head for this hike is very much in question. I have illustrated my preference on the above map, but it is not necessarily the legitimate one. The other option is to begin at the Bonneville Hotsprings Lodge and follow their trail over to this one. The trail to the top of Aldrich Butte follows an old road bed that took visitors to the top via motor vehicle. Even today there are those who ride to the summit on 2, 3, and 4 wheelers. Nevertheless, the hike is fine and definitely worth the effort. The views from the top are great and a fine reward. 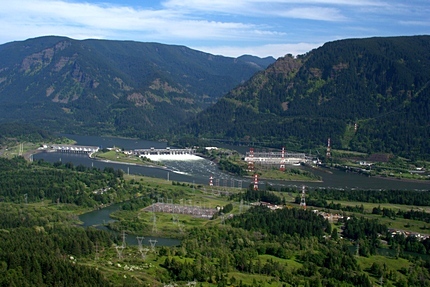 From Portland, travel east on Interstate Hwy 84 to Exit 44 to Cascade Locks. Exit the freeway and cross over the Columbia River into Washington via the Bridge of the Gods. Then turn left, or west, and head about 3.2 miles to Hot Springs Road. Turn right and pass under the railroad tracks, then turn right at the 1st intersection onto Cascade Drive. Follow this road for about 2 miles around the east side of Greenleaf Slough, and around past Bonneville Hotsprings Resort and then west along the	slough to a junction with an unnamed power line service road. Take the service road about a tenth of a mile up a steep poorly surfaced road and at the first intersection, park and walk up the road to the left, which is the trail to Aldrich Butte. From I-205 exit for SR 14 in Vancouver, WA travel east on SR14 through past Camas and Washougal and past Beacon Rock for about 32 miles and you will come to Hot Springs Road on your left. Turn left and follow this road under the railroad to the junction with Cascade Drive. Turn right at the 1st intersection onto	Cascade Drive. Follow this road for about 2 miles around the east side of Greenleaf Slough, and around to the Bonneville Hotsprings Resort. 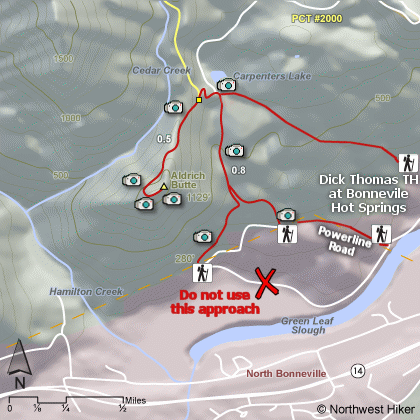 Since May of 2016, we need to no longer travel to the old trailhead that used to be used for Table Mountain and Aldrich Butte as it crosses over private land. So, now you need to park at the Bonneville Hotsprings parking lot. When you come to the entrance to the hotsprings, make a sharp left turn onto E. Cascade Drive, and when come to a stop sign, turn right and drive to the far west end of the Bonneville Hot Springs Resort parking lot. There you will see the trailhead to both Aldrich Butte and Table Mountain. You will have to pay for parking here, so find the front desk and pay the $5 fee. Note: An alternate trailhead can be found by just walking up the power line service road a quarter mile or so, as indicated on the map, but parking is extremely limited. Note: This trail/road is used by motorbikes and ATVs.